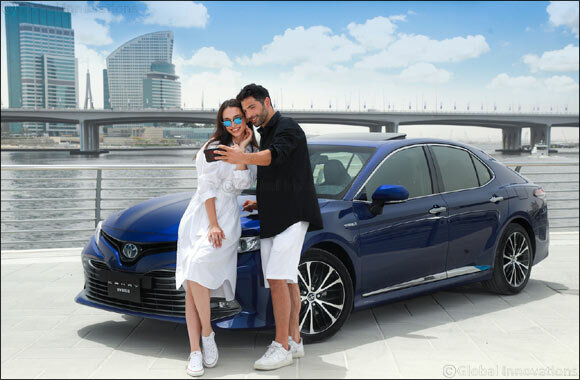 Dubai, UAE – June 5th, 2018: In line with its commitment towards providing environmentally- friendly vehicles, Al-Futtaim Toyota, the UAE sustainable mobility leader since 2008, announced the launch of the all-new Camry Hybrid Electric Vehicle (HEV), offering individuals and corporations the opportunity to be part of of the sustainalbe motoring movement, and to experience the power and pleasure of Toyota’s HEV cutting-edge technology in an engaging driving experience. Toyota Camry HEV was introduced in the UAE in 2008 in a limited quantity, to be tested by fleet operators in the local weather conditionss. After the technology proved its efficiency both on the environmental and financial fronts, the car was officially introduced in 2012 and has since been transporting commuters around the UAE through practical, sustainable travel, saving over 6000 tons of CO2. The all-new Camry HEV provides a comfortable and stable ride with superior handling characteristics, thanks to Toyota’s New Global Architecture (TNGA) platform, which retains all of Toyota’s traditional values of superlative build quality and safety while injecting a fun driving experience that plays on all the senses. “We feel very proud to know that the Camry HEV has been playing an active role in enabling the UAE Vision 2021, and realizing the sustainability targets set by the visionary UAE Government. We believe HEV is a real, practical solution for today’s environmental problems, posing no uncertainties or hesitations at all. With 26KM/L, Camry HEV runs like the petrol engine Camry, except that it drives more for less fuel and less CO2 emissions” Kazzi added. Available in eight distinctive exterior and three interior colors, and 18-inch alloy wheels, the all-new Camry HEV lets customers express their individuality. The car is available across all Al-Futtaim Toyota showrooms at only AED133,500 inclusive of VAT.